Just sit right back, and you’ll hear a tale, a tale of a sticky hand! It started from this little school, in Ana-bear’s backpack. It was a reward for good schoolwork, and Ana-bear was so glad. It was bright pink and kinda looked like hard candy gone bad. Like hard candy gone bad. 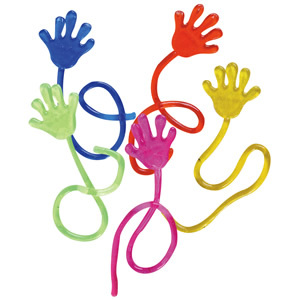 The girls were playing in the playroom, the sticky hand was tossed, and by the time the sun went down, the sticky hand was lost! (In someone’s tummy. Grr….) THE STICKY HAND WAS LOST! We were advised to watch Ana to make sure she could breathe, and stay fever free, and inspect the poo (ugh! ), to eat lots of fiber and drink water, to warn the girls, to never, ever, ever, ever EAT ANOTHER STICKY HAAAAAAAAAND! As if you couldn’t gather from the song, Ana was given a sticky hand at school on Friday. She was super excited about it, and as soon as we got home, she raced upstairs to play with it. I was on the phone when Emma came down the stairs just a few minutes later and whispered, “Ana eated a sticky hand!” I called Ana downstairs and confirmed that, yes, she had eaten a sticky hand. I then asked, in my screechiest Mommy voice, “WHAT IN THE WORLD POSSESSED YOU TO EAT A STICKY HAND? !” Ana’s brilliant answer? “I don’t know.” Then, I freaked out, looking in her mouth to see if perhaps by some miracle it was still there (to which Ana replied, “No, I already swallowed it”). Because this has never happened to us (and I naively believed it never would since we should be past the age of randomly eating things, right?! ), I called the doctor in a panic. The woman answering the phone for the doctor’s answering service told me, “I just answer the phones. Go to the emergency room,” then hung up on me. SOOOO not helpful, y’all. Fortunately, I was able to get in touch with a nurse from our church who advised me to just wait and see, saying that unless she ate something sharp or acidic, it would likely just pass without incident. I told Ana that her timing was unbelievable, given the fact that we had already bought tickets for a movie that night. It’s the Curse of the Date Night, y’all. Every other evening without plans could be catastrophe-free, but date night? Something just had to happen! We had arranged in advance for the girls to hang out that night with Mr. Chuck and Mrs. Laurie (who was the nurse that I called) while we went to the movie, and as we continued to ask Ana how she felt, we thought about cancelling. But wasted tickets, when Mrs. Laurie already knew what was going on and was/is far more capable than I am to assess the danger of an ingested sticky hand? Well, it just seemed silly. That said, we didn’t feel too bad about going on with our plans, sticky hand and all. All that to say, even if your kids are old enough to know better, BEWARE THE STICKY HANDS… and the sticky mouths they find themselves in!